If you want to combine selected PDF pages into single PDF page within PDF, the application VeryPDF PDF Stitcher will be a good choice for you. VeryPDF PDF Stitcher is a powerful PDF n-up maker that can not only combine multiple PDF pages together within PDF, but also can specify some PDF pages and combine the selected PDF pages into a single PDF pages. What’s more, it also supports to set order, gutter, margin size, rotation, etc. for the combined PDF pages. Free download VeryPDF PDF Stitcher and install it on the computer via double clicking the downloaded file and following the setup wizard. The following instructions will tell you how to select specific pages from a PDF file and combine the specified PDF pages into a single PDF page. After launching this software, you can see its main interface on the screen. To add the PDF file into the processing file list, you can choose one of the following methods. Click Add button at top of the main interface, find and choose the PDF file in the popup “Select one or more files to open” file picker window and then click the Open button in the file picker window. Directly drag and drop the PDF file into the application. To choose output folder for the output PDF, please click the Choose button beside the “Output Folder” edit box and choose a folder in the popup folder picker window. To select pages you want to combine, please click the Setting button at top of the main interface to open the corresponding “Setting” interface. Then, in the “Range” group box of the “Setting” interface, please check the radio box of “Page Num” and input the number of PDF pages you want to combine into the edit box below the “Page Num” radio box. (For example, 1,16,17.). 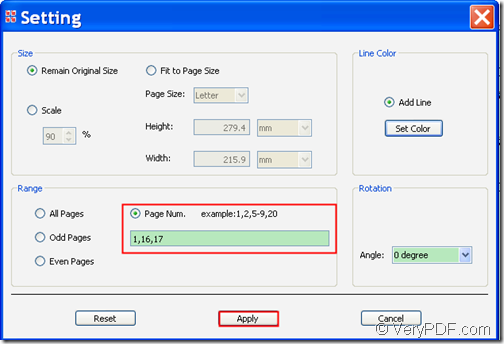 On the “Setting” interface, you can also set combined PDF page size, rotation angle and the line color of the gutter between the combined pages per sheet. After the settings, please click the Apply button at bottom of the “Setting” interface to apply the settings. Please see it in the following snapshot. 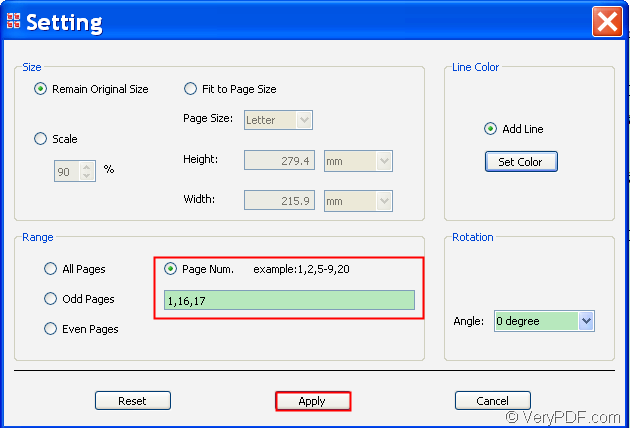 To combine the selected PDF pages into a PDF page, please choose the item “Custom” in the dropdown box of “Pages per Sheet” and then input the number of PDF pages you have selected in the above step in the first edit box beside the “Pages per Sheet” dropdown box and input 1 in the second edit box. Please see it in the following snapshot. After that, please click the Start button at top of the main interface to combine the selected PDF pages into a single PDF page. You can see the effect from the following snapshots. This is the end of this article and you can get full version of VeryPDF PDF Stitcher here.